More than often, you will choose to go out camping during super hot summer days. The weather is always unpredictable, and temperatures may shoot up to high extremes making it unbearable to enjoy your time inside a tent. With a portable tent air conditioner, you can manage internal temperatures to maintain a comfortable camping experience. There are selections upon selections of tent ventilation systems available. The question would be, which A/C is worth your money and would get the job done right? 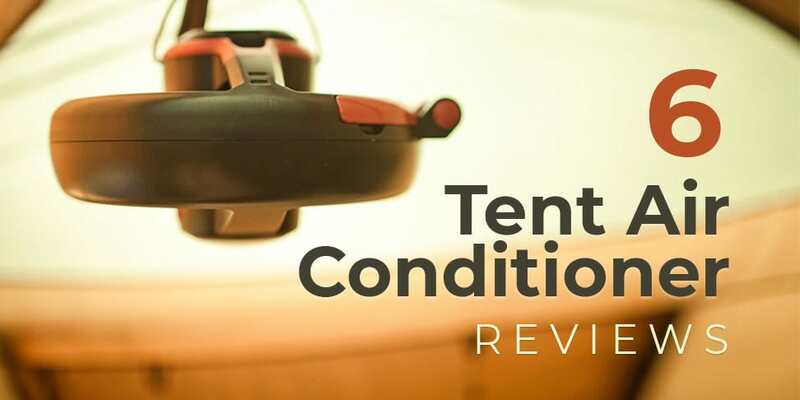 We decided to help take the heat out of it and compiled a list of 6 best tent air conditioner reviews. Controlling outdoor temperatures is almost impossible in theory, but with the help of a good tent air conditioner, you can stay comfortable when out camping. There are choices among vast choices available, but a few key features can help direct you to the best tent air conditioner for your family or group. It is a no-brainer that you need a correctly sized AC unit to receive the appropriate amount of cooling. It means going for a large enough air conditioner to handle a family-sized tent and a compact unit for a solo tent. The AC for tent units ranges from 5000 to 10,000 BTUs. A 5000 BTU unit can serve the cooling needs of a small to medium sized shelter efficiently. Not to say that you will not come across larger capacity air con units, and in fact, we found one that delivers an impressive 14, 000 BTUs. Naturally, you want to go for an AC providing higher BTUs to take care of unusually humid days spent inside a large-sized tent. Window, Ceiling or Room placement? Surprisingly, window-based A/Cs perform best at cooling tents compared to room/ceiling fans. They go on a window, wall or the tent’s doorway regarding placement. The room-based air cons rely on a power source from an electric outlet. Most of them sit upright, making it easy to place them anywhere within the tent. They tend to be bulkier when compared to the window ACs. Room-based coolers typically have water reservoirs which end up collecting condensed water. For this reason, such units will usually also come with a dehumidification function. The ceiling fans exclusively run on batteries with some featuring provisions for AC power adaptor use. They typically include magnetic plates for easy installation. Some may also have lighting functions, but they do not produce an adequate amount of cooling. There is also the option of going for an AC boot for tent kit. It transforms a 5000 to 8000 BTU air con into an outdoor cooling solution. The best tent air conditioner will make your time away feel as comfortable as you would be right at home. While the ultimate goal when looking for a good tent air conditioning system is to find one that provides adequate cooling, it does not hurt to go for a portable air conditioner offering more functions. Some units provide a heating function in addition to functioning as tent coolers. You might also find a few ceiling fans that come with a lighting function. Another helpful function that most air conditioning units come with is a dehumidification feature. Aim for one that can remove more pints of humidity per hour or day from the air. It is also worth finding out how many volts an air con needs to avoid unnecessary surprises when hooking it up. Most will use standard 115V outlets, but you want to pay attention and get a suitable one. Naturally, you want a portable air conditioner that will not become too much of a haul to take with you when camping. Better yet, you want a unit that can still serve your cooling needs at home and allows you to take it with you out camping. A lightweight AC should do the trick, but it is also possible to find units with rolling casters. This portable air conditioner is a best seller on Amazon with over 2100 positive reviews. This lightweight mini air con uses a window-mounted installation model. It features a high power efficiency rating. A window mounting kit comes with the package. Folks who intend to camp where there are electrical outlets. Anyone who is comfortable spending between $125 and $222 on a portable cooling system. This bad boy is compact, but it would best suit RV campers because of its window-mounted model. You do not need any hardware to set it up, which still makes it a great portable air conditioner. The Frigidaire FFRA0511R1 unit is also versatile allowing you to use it at home and take the same one along with you for those outdoor adventures. However, you need electrical outlets to use this mini air con, so this might be the best tent air conditioner if you’re planning on hitting campgrounds with electrical hookups. It is a 5000 BTU portable air conditioner that uses standard 115V outlets. The mini air con provides quick cooling covering up to 150 sq. Ft. The mini AC also functions as a dehumidifier, and it can reduce humidity levels at a rate of 1.1 pints/hr. Another helpful feature is the ability to adjust speed and fan direction with mechanical rotary controls. You get a choice between two cooling speeds, a 2-way air direction, and two fan speeds. The unit can start up with low power helping to conserve energy. It also restarts automatically after power outages and resumes operation at the previous settings. It features an 11.1 EER (Energy Efficiency Ratio). A washable mesh filter accessible through a side slide-out lends a hand in reducing room odors, bacteria, and airborne particles. Its measurements are 16 inches W by 15 1/4 inches D by 12 inches H.
This Frigidaire mini AC is what you need a dual solution to cool things down at home and when camping outdoors. This 5,000 BTU portable air conditioner ranks second as a best seller on Amazon. It uses a quick window placement model. Who needs this cooling unit? Campers who frequent campsites with electric hookups. Folks willing to spend $199.99 on a tent air con. Like the FFRA0511R1, this mini AC serves both at-home and outdoor cooling needs. The Frigidaire FRA052XT7 features a window placement making it easy to setup within no time, and it would suit both RV and tent campers. Again, you will have to settle for campsites with electrical hookups, which is not that much of a dealbreaker. If you’re willing to do the extra research, this might be the best tent air conditioner for you. This window unit comes with a 5,000 BTU cooling capacity. It can cover up to 150 sq. Ft and quickly bring down room temperatures. Adjust the cooling reach with a 2-way direction control. An antimicrobial mesh filter enhances the unit’s hygiene, and it is removable and washable. An easy-access side slide-out enables the removal of the filer for cleaning purposes. Rotary controls allow you to change speed and fan directions. It fits perfectly in 23 to 36″ windows. It supports a low voltage start-up helping with energy conservation efforts. In the event of a power outage, the unit restarts automatically and resumes function at its previous settings. It also functions as a dehumidifier with a 0.8 pints/hr rate. The window-mounted AC works with your standard 115V outlets. The unit measures 13.2 by 16 by 12 inches. Go for this unit for the same reasons you would get the FFRA0511R1. It is also an excellent choice for anyone who wants a versatile and portable air conditioner. The Coleman brand is well known for the quality products they produce, and this extends to the outdoor niche. Their selection of outdoor products aims at making the experience more comfortable and pleasurable, and some might say they make the best tent air conditioner available for a great price. It is a tent ceiling fan. You get a portable ventilation and light deal. Folk who want a ceiling tent fan. Young campers who need the security of a nightlight. The discount camper who wants to spend under $50. Every camper would find this portable Coleman fan a valuable solution for outdoor ventilation. Its ceiling placement and lighting function make it an excellent choice for tent use. It is battery-powered, which means that you can use it anywhere, but on the flipside, its performance relies on how much juice they receive from the batteries. The Coleman Zephyr fan is suitable for most tents, and it comes with a magnetic plate to help set it up. It provides a dual function working as a portable tent ventilation system and light. The fan and light features function independently. Switch between two light modes; white and amber as a nightlight. Adjust the speed of the fan between two modes; high and low. The fan blades are foam-made making them safe to use around children. Run it for up to 24 hours at high speed and 48 hours on low. Four D-cell batteries are the power source of the fan. While it may not perform like the window-mounted models, it is a good investment for the discount camper. The A/C adaptor power option. It comes with a built-in stand. Any camper who wants a portable fan to use anywhere. Anyone looking for a fan and light dual deal. It operates relatively quietly for a fan. This second Coleman fan on our list is also another worthwhile investment for every camper. It may be too heavy to hang up on your tent as a ceiling fan, but it works well as freestanding fan thanks to the built-in stand. The Coleman fan works with four D batteries, A/C adaptor cartridge, or a rechargeable cartridge. A carabiner clip or magnetic plate comes with the unit. It can be used as a freestanding fan because it comes with a built-in stand. The tent ventilation unit produces up to 99 lumens of brightness with the help of its 5-mm LED lights. Switch between white light and nightlight modes. Control the fan by adjusting it to high or low as needed. Its dimensions are 10.2 by 7.1 by 11.8 inches. It may not be the most powerful of fans to use during summer, but we still recommend it because of its dual ventilation and lighting functions. Grab this air con from Amazon. This 14,000 BTU portable air conditioner delivers efficient cooling and heating. This air conditioning unit functions as a portable fan, heater, and dehumidifier. Can cool up to 525 sq. Ft spaces without the need for permanent installation. Family-sized tent owners and RV campers can benefit from this portable cooler. Folks who are willing to spend $399 for a tent cooling solution. This EdgeStar air con falls on the larger side of the portable air conditioner scale, but it does come packing the right amount of cooling juice you need on hot summer camping trip. It is a dual hose air con providing both heating and cooling that make it ideal for all-around use. It does require ventilation like all other portable ACs, but a window vent and hose kit comes with the package. This air con produces 14,000 BTUs of cooling/heating. It covers up to 525 sq. Ft spaces. A self-evaporating technology comes with the deal with an LED touch display and electronic controls. It also features an intelligent auto mode. Switch between dehumidification, heat, and three fan speeds, and a 24-hour programmable timer. It also comes with casters. You get a remote control making temperature and control adjustments much less of a hassle. It covers a temperature range of 62 to 88 degrees Fahrenheit. The dehumidifier feature removes 71 pints of moisture from the air each day. The unit’s measurements are 35 by 18.5 by 15.75 (H, W & D) inches. It requires venting with the help of the window vent and hose included. The air con runs on electricity and water. We say, buy this portable air conditioner for your family-sized tent. It is a 10,000 BTU window unit. This portable air conditioner covers up to 450 sq. Ft spaces. It is Energy Star Compliant guaranteeing energy efficiency and eco-friendly operation. Who needs this portable ventilation system? Large tent owners and RV campers. Much like the EdgeStar AC, the Koldfront air con unit comes engineered to meet the cooling demands of a family-sized tent. It covers an equally large surface area, with easy-to-install window placement. It does not perform too well when it comes to dehumidification with the chances of building up a foggy mist. With proper ventilation, this should not be much of a problem, but if it does prove to be a nagging issue, you might have to buy a separate dehumidifier. This Energy Star rated AC features an energy saving mode with a 24-hour timer. It also comes with an LED filter alert. The functions are adjustable with three fan speeds, a dry mode and sleep mode, and with the ability to cover up to 450 sq. Ft spaces. Its input voltage is 115V/60Hz. A remote control comes with the 10,000 BTU unit. An auto function can control the thermostat with periodic temperature adjustments as an energy saving feature. Its temperature range is 62 to 86 degrees Fahrenheit with the ability to cover up to 450 sq. Ft spaces. The unit measures 14.6 by 19 by 21 inches (H, W & D) and it fits comfortably into 23 to 36-inch windows. We say get the Koldfront if you want all the great features that come with the EdgeStar at a lesser price. Have a look at reviews on Amazon to help you make the decision. Which is the best AC money can buy? Our list of tent air conditioner reviews should have given you a general direction about which AC will serve you best. However, the lingering though must be which one will offer the best value for money. When buying anything, the unwritten rule is to always go for quality over cost. The Frigidaire AC is the best selling portable air conditioner on Amazon and our top pick. It is also available at a relatively affordable price, ranging between $125 to $222. However, if you want a unit that gives you the best bang for your bucks, then we would suggest the EdgeStar cooler. It covers a larger surface area when compared to the Frigidaire and comes with wheel caster for enhanced portability. The programmable timer and adjustable thermostat control make it much more impressive for a portable air conditioner. The Coleman tent air conditioners would best serve the discount camper. It does not hurt that they also come with a lighting function and ceiling placement. However, this portable air conditioner would best suit the solo camper or a kid’s tent in need of the handy nightlight function.